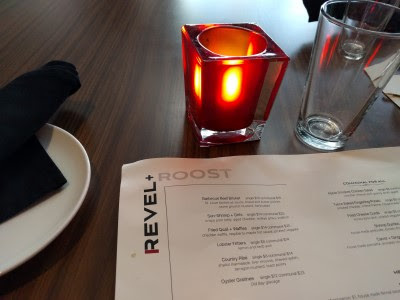 Last Saturday we decided to try Revel + Roost, a restaurant that recently opened (mid-March) in the Hilton Garden Inn at Market Square. We found the reservation process a wee bit confusing. 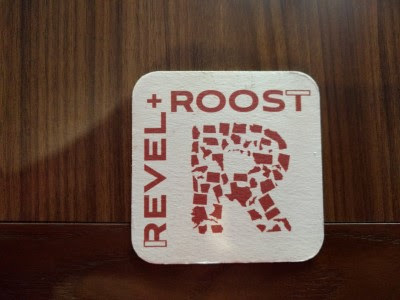 Revel is downstairs, Roost is upstairs. Revel has been billed as more of a lounge where they expect a younger, energetic millennial crowd while Roost is a more traditional dining experience. 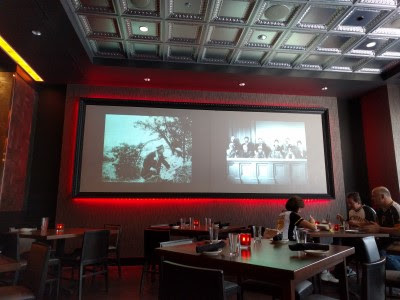 We are not young, energetic millennials, but we wanted to dine in the more casual Revel. On their website, it sounded like you could make reservations for either. We made reservations on OpenTable, but it wasn't clear if the reservation was for Revel or Roost. Later when I called, I was told you can reserve for either but the OpenTable reservations are for Roost unless you specify Revel in the comment area. I made sure the reservation was for Revel, but there was still some confusion when we arrived. Fortunately, they were able to seat us in Revel. Note: if you are seated in Roost, you cannot order from the Revel menu. Revel's interior is spacious, blacks and grays and a bit of red. The front windows were open on the lovely, sunny, warm spring day. The screen plays silent movies and we both enjoyed watching the old black & white films. 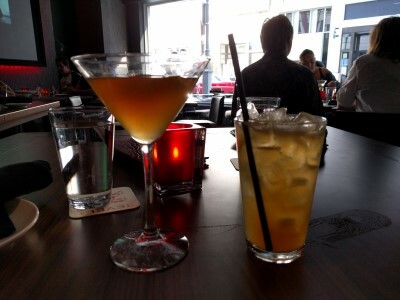 Black Walnut Bitters) and SP chose Pittsburgh Stock Exchange (Jim Beam Bourbon, House Made Apple Shrub, Lemon Juice). peppercress, honey dijon vinaigrette). I'm sure that's the salad we chose, that's what the receipt says, but there wasn't any goat cheese nor was there a honey dijon vinaigrette that I can recall. I remember carrots, radish, cucumber, broccoli rabe, tiny pattypan, and some leafy greens. 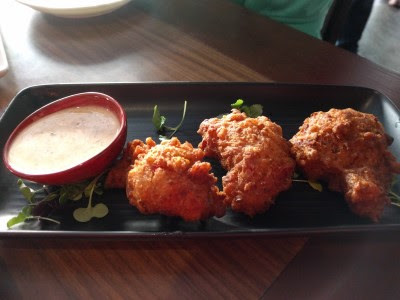 Lobster Fritters (lemon and herb aioli). Fried dough with lobster. Tasty. Sun-Shrimp + Grits (crispy pork belly, aged cheddar, redeye gravy, scallion). I liked that the slightly spicy to me gravy was off to one side so I got to enjoy most of the dish without giving my stomach the usual grief of spicy food. 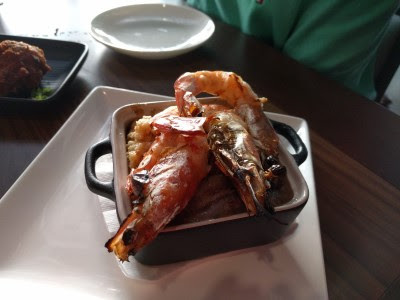 I really liked this but had to make SP handle the shrimp head part before I could eat the shrimp. My second favorite dish. Fried Cheese Curds (honey dijon aioli, pickled veggies, herb salad). 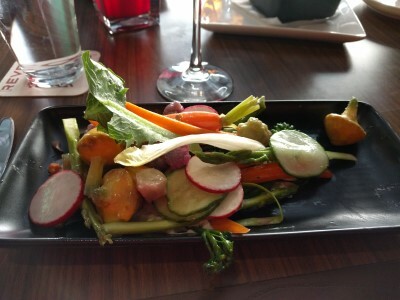 I don't recall the herb salad, just pickled broccoli rabe and the tiny pattypan. 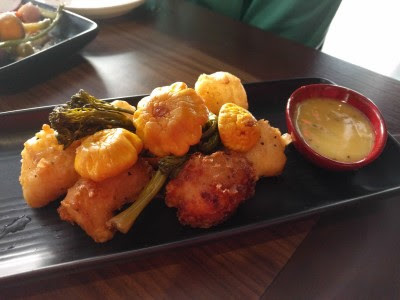 The cheese curds were good, but since they were huge curds, almost a little too chewy and squeaky for me. 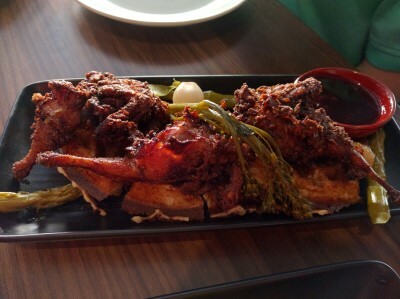 Fried Quail + Waffles (cheddar waffle, raspberry-maple hot sauce, pickled veggies). SP loved his fried quail and I let him eat it all because he was so excited about quail. I ate most of the waffle which was good. The syrup was tasty, too, but a wee sweet, even for me. This was SP's favorite dish of the meal. 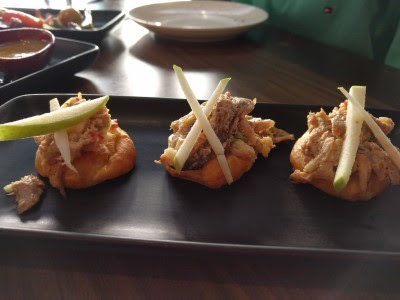 My favorite dish was this: Apple Smoked Chicken Salad (cheddar cheese puff, granny smith apple). I'm ready for warmer weather foods like smoked meats and chicken salad. The chicken had a nice smoked flavor and made me anxious to pull out our smoker. Hearth Oven Pizza, New York or Chicago Crust. We chose Chicago crust and mushrooms. It wasn't what I was expecting. 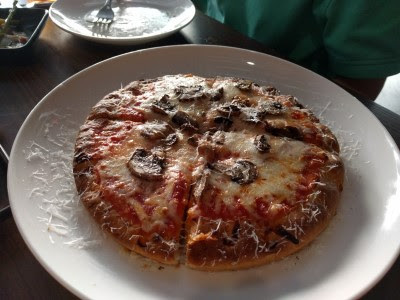 I expected deep dish pizza, with a deep crust, almost like a pie or tart shell, filled with layers of sauce and cheese, baked in a pie/cake pan. This was just a thick crust. We both wished we gone with New York crust because thick crust like this isn't our kind of pizza crust. 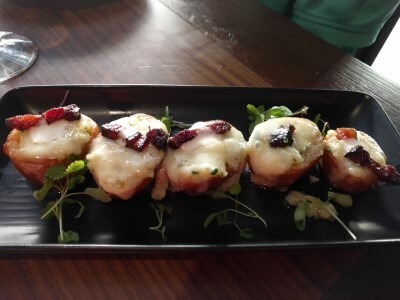 Twice Baked Fingerling Potato (smoked cheddar, crème fraîche, house made bacon, chives). These were very good but we were so full by the time they arrived that we took a tiny bite just to try and then took the rest home. They made a tasty lunch the next day. Yes, we ordered too much food. We could have/should have ordered 2-3 fewer to try and we would have been full. I'm glad we tried everything we tried. Our server was wonderful, very friendly, attentive, kept SP's iced tea filled, brought extra plates, spaced out our plates of food nicely. It's in a great location and there's a parking garage right there. We'd go back.